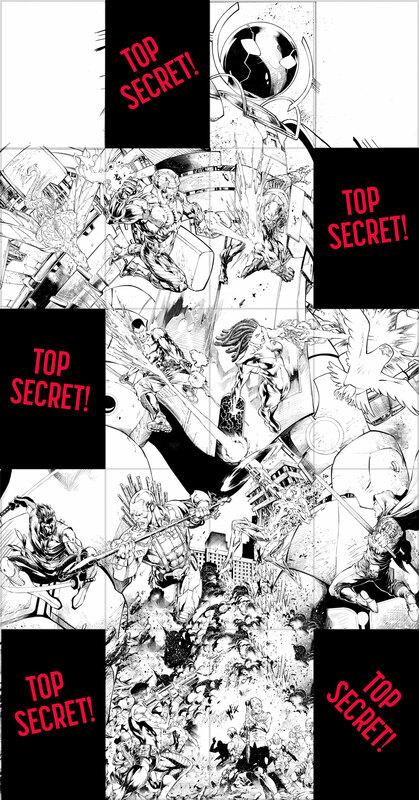 VALIANT Reveals World’s Largest MEGA-COVER for ARMOR HUNTERS – Limited to Six Participating Retailers! The summer’s biggest crossover event is about to get even bigger! Valiant is proud to announce the ARMOR HUNTERS 18-PART MEGA-COVER – a limited edition, one-of-a-kind interlocking cover divided across all 18 issues of ARMOR HUNTERS, this summer’s hotly anticipated crossover event featuring X-O Manowar, Bloodshot, the Unity team, and many more of Valiant’s most formidable heroes. Featuring a colossal, four foot tall by two-and-half foot wide cover image by heat-seeking rising star Diego Bernard (X-O Manowar, Red Lanterns), the ARMOR HUNTERS 18-PART MEGA-COVER is the biggest comic book cover ever attempted in the history of the medium, and will span all issues of the ARMOR HUNTERS crossover event beginning this June – ARMOR HUNTERS #1-4, UNITY #8-11, X-O MANOWAR #26-29, ARMOR HUNTERS: BLOODSHOT #1-3, and ARMOR HUNTERS: HARBINGER #1-3. Spotlighting each of Valiant’s greatest heroes – and a few select classified recruits – as they combat the ARMOR HUNTERS‘ brutal invasion of Earth in search of the X-O Manowar armor, this is the only place to witness the true size and scale of the Hunters’ deadliest asset – the gigantic alien robot simply called GIN-GR. “As soon as we saw Clayton Crain’s amazing character designs for GIN-GR, and the rest of the Armor Hunters, we knew that this was going to be an enemy and a crossover unlike anything else in comics. But we also wanted to present it in an equally bold manner on the shelf. When it comes to the biggest story that Valiant has attempted to date, what could be more appropriate than the world’s biggest cover?” said Valiant Publisher Fred Pierce. At all 9 locations in Illinois! At all 3 three location in Virginia and Ohio! 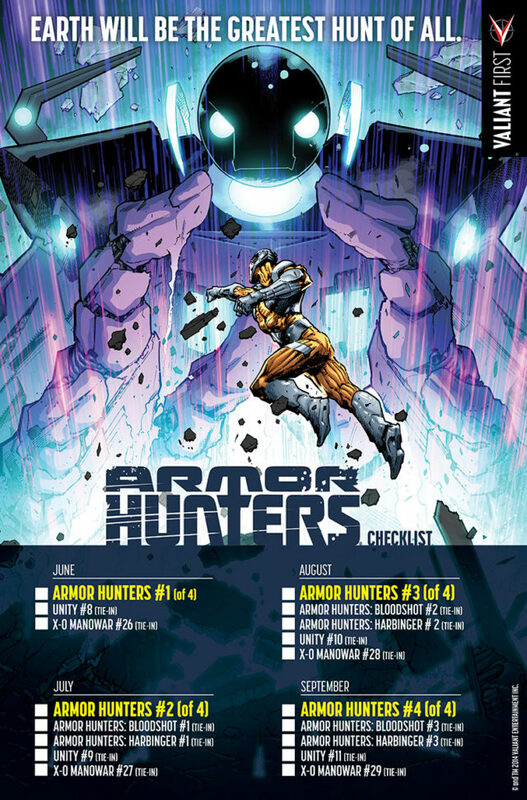 In the tradition of the universe-shaking HARBINGER WARS, the year’s can’t-miss crossover event begins in ARMOR HUNTERS #1 (of 4) – and then continues with new arcs beginning in UNITY #8 and X-O MANOWAR #26 in June; and ARMOR HUNTERS: BLOODSHOT #1 (of 3) and ARMOR HUNTERS: HARBINGER #1 (of 3) in July – each featuring one of five wraparound Chromium shelf covers by some of the biggest talents in comics today! To get in on all the action from start to finish – and to assemble your own ARMOR HUNTERS 18-PART MEGA-COVER – contact a participating retailer today to pre-order!